Arctic Abyss is the twenty-eighth level of Donkey Kong Country 2: Diddy's Kong Quest and the first level of K. Rool's Keep. This level is the first ice-themed one of the game, excluding Black Ice Battle of the Lost World. Most of the level is flooded, but the Kongs are forcefully transformed into Enguarde for most of the stage. The water level changes at certain points, which means Enguarde cannot return to collectible items when he passes them. In the Game Boy Advance version of the level, the level terrain is green. When they begin the level, the Kongs must plunge into the water and start swimming. They need to watch out for a few enemies as they go, and also have to squeeze through a tight space with some Puftups around. Soon, they will reach an Animal Barrel and turn into Enguarde the Swordfish. Enguarde must then continue along the path and defeat several foes, including the sneaky Shuries that can come shooting at the fish at any second. Later, the swordfish will have to swim north and avoid a few Puftups, then travel west. The water will go down here, so the fish must go quickly if he wants to find any special prizes. Once he goes the whole way west, he needs to go north and beat some Shuries. Then, he should swim west again and break the Star Barrel. From there, Enguarde must swim in a U shape and avoid four Puftups, as well as three Shuries. Then, he should quickly dash east before the water rises, so he can obtain a few more special prizes on the way. After the fish makes it the whole way east, he needs to swim around another U shaped path, and avoid enemies. Eventually, he will have to make his way west and swim fast, before the water level decreases too much. Then, Enguarde must continue east between the cold ice, and defeat four Shuris swimming around him. Then, he needs to move on and beat some Puftups, until the water decreases again. He must trudge over the land if he is stuck, and travel south, where he'll meet some Lockjaws. When they are defeated, the swordfish should cross the No Animal Sign, and finally turn back into the Kongs. Diddy and Dixie must jump onto the End of Level Target and exit the stage. End prizes include a Banana, a Banana Bunch, Banana Coin, or a red Life Balloon. After the water rises a little and Enguarde sees the first Lockjaw of the level, he should swim upwards. He should see a wall with two bananas next to it. 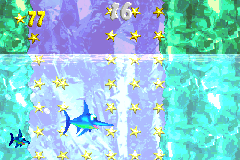 Using his special ability, the swordfish must blast into the wall and create a small opening, which he should swim into. It will take him to a Bonus Level, where he must swim down the path and collect 100 stars. The water level will decrease, so he must collect the stars fast, or it will pull him away from them. If he obtained enough of the objects by the end, he can grab the Kremkoin. Once Enguarde passes the last two Puftups in the level, he should swim through the small gap nearby and travel to the right. He will go through the wall and cross a No Animal Sign, which will turn him back into the Kongs. Then, they must enter the entryway farther on, and enter the Bonus Level. Here, they have to run down the path and simply throw a treasure chest at a few Zingers. When the chest finally breaks, a Kremkoin will pop out to obtain. Obtainable by jumping over the gap at the start of the level. Encircled by two Shuri before the Star Barrel. Proceeding the "N" Letter, a Lockjaw, and three Shuri, the water level will sink upon entering a room. As the water rises, Enguarde can swim for the "G" in the top left corner of the room. DK Coin A little while after the Star Barrel, Enguarde will have to begin traveling east. The water will decrease here, so he must use his special ability to shoot at a fast speed, and slide to a large platform. 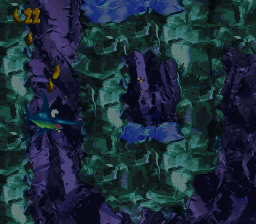 Unless the water sank too much for him to get up here, the swordfish should find the DK Coin right up ahead. Golden Feather (GBA version) Near the end off the level, Enguarde must avoid a few Shuries and then begin to travel west. As he goes, the water level will decrease, and he will see the Golden Feather above the water. To get it, the fish needs to swim along the path for a while until the water rises again. When it does this, he should go back, and grab the feather. 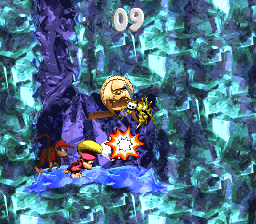 Photograph (GBA version) To find the photograph, the Kongs must transform into Enguarde and head down the area, where the water recedes. At that point, the swordfish should swim to the bottom left part of the area, going through the wall. Inside a small, hidden area, he will find the photograph and two Banana Coins. The collected photograph is a picture of Enguarde. Diddy and Dixie swim to the Enguarde Barrel. A Shuri spins at Enguarde. Enguarde swims up a path. Enguarde finds the letter O.
Enguarde finds the DK Coin. Enguarde sits outside the second Bonus Level's entry. Diddy and Dixie find the Kremkoin of the second Bonus Level. Enguarde swims to a Puftup. The location of the "N"